• Sports’ Greatest Scientific Coach: Former third baseman for Alaska Goldpanners utilizes science in every facet of his coaching. • Bat Testing Expected To Start In-Season in 2020: Cost for schools will be $1,500 a pop for testing devices which should stop hot bat problem. 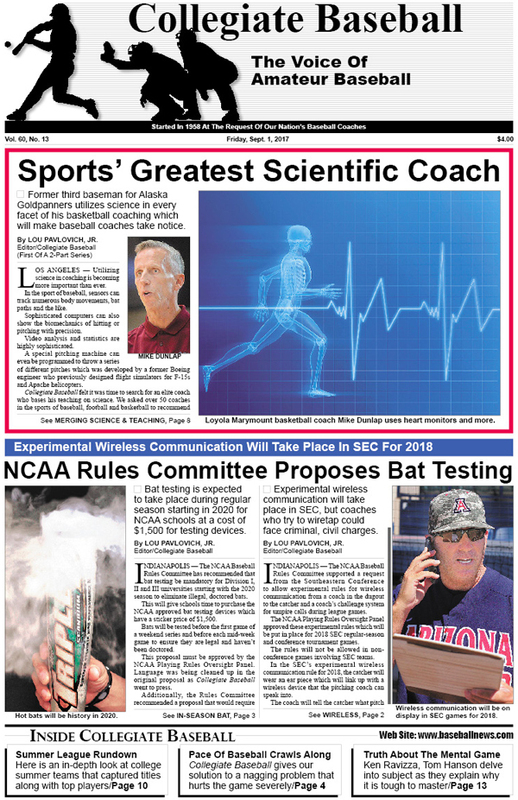 • Experimental Wireless Communication: SEC will utilize this type of pitch calling in 2018. But if opposing coaches try to intercept calls, they could face criminal, civil charges. • Rundown Of College Baseball Summer Leagues: Collegiate Baseball gives an in-depth look at college summer teams that captured titles along with top players. • Legendary John Herbold Dies: This amazing baseball coach for 49 years on the high school and collegiate levels was a giant in the industry who also interviewed hundreds of top coaches in the game with their intriguing thoughts in Collegiate Baseball. • Lou Pavlovich Column On John Herbold: This remarkable man shared all the baseball lessons of life he learned in 49 years of coaching and interviewing top coaches in the game, and we delve into his most important messages. • Editorial: College baseball takes too much time to play, and Collegiate Baseball has a simple solution to solve this nagging problem. • Coaching Changes Across USA: Numerous coaches jump to different programs during the past summer. • USA Baseball Rundown: CB delves into Team USA’s 15U first place finish at the COPABE Pan Am “AA” Championships along with how the Collegiate National Team fared, 17U National Team and others during the past summer. • Dr. Ken Ravizza & Dr. Tom Hanson: The authors of Heads-Up Baseball 2.0 explain why the mental game is so complex and incredibly messy. • Ruleball With Rich Marazzi: Explanation given why Major League Baseball rejected Red Sox protest of a game against Yankees. To purchase the Sept. 1, 2017 edition of Collegiate Baseball or subscribe, CLICK HERE.